Twice a year, we at Greenspring Associates hold offsite meetings attended by all investment team members, from Managing General Partner to Intern, to share and collaborate on ideas outside of our day-to-day activities. These sessions serve to facilitate communication amongst the team, promote creativity and set intentionality around the direction of our business in a coordinated fashion, both from a strategic and investment perspective. The first of these meetings takes place in January, and this year’s happened to occur on the day we announced the successful $999 million raise of our ninth global diversified venture fund. One of the hallmarks of this event was what some bantering team members referred to as a “fireside chat” with two senior team members, who recounted the early days of our Firm. At this inflection point, it was clear to the audience that some things have changed dramatically over the last two decades, with a team that has grown to include over 70 individuals, one of the largest dedicated to the venture capital asset class and certainly the largest in our history, and assets in excess of $8.7 billion. And yet the guiding principle that deep relationships built on mutual trust lead to better returns echoed in every anecdote and were familiar to even our most junior team members, because they continue to govern the Firm’s culture and values nearly twenty years later. As venture capital investors, we are proud to fuel the innovation economy and those visionary entrepreneurs building businesses that are changing the world for the better. We believe professionally and personally that venture has the power to be a force for good and is intellectually stimulating, something the world needs, and a means to deliver outsized returns to stakeholders. We are inspired by the thousands of transformative companies we’ve had the opportunity to partner with, either directly or indirectly, that, to name just a few, are redefining the way we listen (Spotify), exercise (Peloton) and adventure (Outdoorsy), or those that have recently made headlines for developing revolutionary new cancer treatments (Forty Seven) and solutions to big societal problems (Pear Therapeutics). We also believe that venture capital is an essential component of the health of the U.S. economy and are pleased to report that Greenspring funding has contributed to the creation of a total of 1,065,783 high-skilled jobs, which benefit society by providing meaningful purpose, fulfillment, and financial stability to American workers and propelling long-term economic growth. We are committed to doing well by doing good and fund world-positive companies through our inaugural Impact-oriented fund, as well as more broadly integrating environmental, social and governance (ESG) considerations into our investment process. 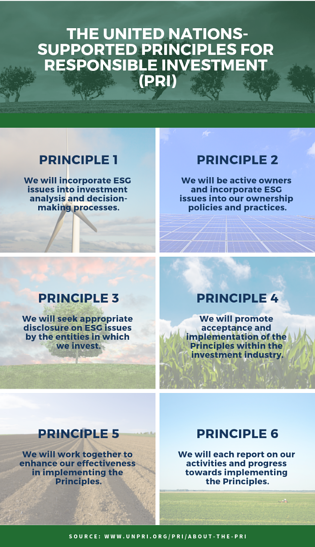 In 2018, as part of these ongoing efforts, we signed the United Nations-supported Principles for Responsible Investment (“PRI”), the world’s leading proponent of responsible investment, committing to the initiative’s six principles. But the real heartbeat of our organization and the Why behind what we do is our trusted relationships with Limited Partners, General Partners, portfolio company CEOs and employees. Our mission is to build unique, differentiated partnerships with each of these constituents that have the potential to withstand the test of time. We strive to be a trusted teammate to our various partners by doing what we say we will do, acting with the highest integrity, operating with transparency, building relationships and doing what’s right when that is hard. Headquartered in Baltimore, we aspire to embody a humble, industrious, community-based organization and promote a blue-collar work ethic in what has traditionally been a white collar industry – with a pragmatic eye to the future. With respect to our Limited Partners, our raison d’être is to provide a comprehensive venture capital platform from which they can select a diverse assortment of fund, direct and secondary investment strategies to suit their risk and return objectives in any market cycle. We hold this privilege with great care because, to us, our investors represent more than mere capital. Some of our clients are hospital systems and research institutions helping people through the pursuit of revolutionary medical studies. Educational investors entrust us with capital to fuel their endowments that benefit underlying programs and students, and behind the checks from public state or police employee retirement systems are individuals who have dedicated their lives to public service. And, while we have the humble responsibility of managing large pools of money on behalf of some of the largest institutional investors, we remain loyal and grateful to our earliest investors, regardless of size, who believed in us when our Annual Meeting was held in our founder’s basement and who honor us still by participating in each and every one of our funds. With this in mind, we strive to be a different audience to our investors: we are available to take your call, grab that coffee and spend the time to understand and meet your investment needs. With respect to our General Partners, we endeavor to be the most trusted lifecycle partner to the best venture capital firms by being an enduring and flexible primary, secondary and direct investor. With deep roots in the venture capital industry and relationships that date back to nearly two decades ago, we have a long-term approach and a proven ability to partner with venture managers through the ups and downs of the economic environment. We can invest at the earliest stage, serve as a secondary buyer of directs or fund interests, or be a growth or expansion stage financier. A central tenet of our organization’s culture is our belief in the importance of contributing to each of our relationships, and we have formalized a Portfolio Impact Program in an effort to add value to existing and prospective managers through strategic connections, including introductions to corporate partners who represent potential customers, partners or acquirers, qualified deal introductions and introductions to the Firm’s Limited Partners. Greenspring Associates curates these connections on both a one-on-one basis and in larger forums, and has made over 1,000 deal referrals and 350+ prospective investor introductions to our managers. In addition, as a meaningful fund, direct and secondary investor, Greenspring has access to detailed metrics that in many situations include financials, valuations and burn rates on over 6,400 venture-backed companies. In light of our informational advantage, we have institutionalized a Business Intelligence Team focused on tracking and storing investment, prospective investment and portfolio management data, both at the Fund, direct and underlying fund level, via a customized database. Through machine learning, data analytics and visualization, the Business Intelligence Team has visibility on variety of topics, and, via our GA Insights program, provides Greenspring fund managers with actionable insight utilizing the Firm’s robust data sets. When it comes to our entrepreneurs, we represent a streamlined investor, having built long-term relationships with the General Partners that back them, and, to some extent, the companies themselves, well before investing directly. As indirect investors, we have knowledge of their startup that ranges from preliminary to detailed, and can expedite the investment process so that they can remain focused on building their businesses. As lifecycle investors we can lead the round or follow on, write a check for $5 million or $50 million, are flexible when it comes to the cap table and can scale with the company over time. Our previously mentioned Portfolio Impact Program has yielded real benefit to portfolio companies as well, resulting in over 2,300 qualified customer leads and 220+ executive-level talent connections to date. “Culture eats strategy for breakfast.” Controversially and debatably attributed to the late management guru Peter Drucker in 2006 by former Ford Motor Company CEO Mark Fields, but a great quote either way. Lastly, we are committed to an internal culture that combines our mission with a collegial and entrepreneurial atmosphere, offers our employees the opportunity to be challenged and grow doing work they feel good about, values the team over the individual, and rewards contributions to society. Greenspring encourages community involvement through regular community service outings, referred to internally as Give Back Days. All employees are required to participate and the Firm’s activities serve to aid the local community. We have made charitable donations to over 95 organizations in the last three years, and individual members of the Firm are actively involved in a number of philanthropic causes, including WE.org, PACE, CASA and Outward Bound. We support these causes because they are important to our investors, but also in recognition of and gratitude for all the ways in which our community has supported us. Greenspring Associates has built a culture of constant improvement, which is to say we incessantly endeavor to surpass our own efforts and evolve. An unofficial internal motto is “What could we have done differently to make this better?” We all read Grit and Extreme Ownership as part of our onboarding process to foster resilience and accountability. And we are all expected to prioritize integrity and hold relationships, both internal and external, with care. Every person, from Administrative Assistant to Partner, makes crucial contributions to the Firm’s mission and success, and we are grateful for our team, without whom none of our achievements or goals are attainable. So, as we go forth into the New Year, we wish to express our gratitude to our investors, managers, portfolio company CEOs and employees for placing their trust in us and affording us the opportunity to participate in helping companies change the world in a positive way. As proclaimed on t-shirts we recently distributed to employees, Rise and Grind. We will continue to search for ways to rise to the occasion. Strong, Michael, Be the Solution: How Entrepreneurs and Conscious Capitalists Can Solve All the World's Problems, John Wiley & Sons, 2009. Jobs created figure was derived by using a combination of Pitchbook, LinkedIn, and various public data sources to determine the number of employees at Greenspring’s underlying portfolio companies (since inception) at the time of funding and at the time of Greenspring’s exit. Unknown company counts were extrapolated upon by extracting the median initial/final company counts for companies of the same subsector. The content here is for informational purposes only and should NOT be taken as legal, business, tax, or investment advice. It does NOT constitute an offer or solicitation to purchase any investment or a recommendation to buy or sell a security. In fact, the content is not directed to any investor or potential investor and may not be used to evaluate or make any investment.